Protein-heavy diets are typically considered the best choice for cats, but new research says otherwise. Many veterinarians believe that cats enjoy protein-heavy foods and require a diet that is 40% to 50% protein. But new study findings are challenging this common belief. “The numbers were much different than what traditional thinking would have expected,” said Jean Hall, DVM, PhD, professor at the Oregon State University Carlson College of Veterinary Medicine and one of the study investigators. Dr. Hall, along with her collaborators from Hill’s Pet Nutrition Center, discovered that while dogs seem to gravitate toward high-fat food, many cats prefer foods with high levels of carbohydrates. Their findings were recently published in the Journal of Experimental Biology. According to the investigators, previous studies showing that cats preferred very high levels of protein did not balance palatability among the foods being offered. For the current study, the investigators masked palatability, causing long-term food choices to be based on physiologic requirements. 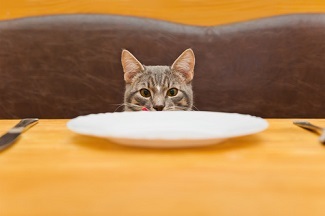 "When you balance palatability, both dogs and cats prefer significantly different macronutrient content than what they would choose based on taste,” Dr. Hall concluded. Over 28 days, 17 healthy adult dogs and 27 cats were given the choice between 4 experimental foods with similar palatability but varying in macronutrient composition. Once flavor was taken out of the equation, cats on average chose to get 43% of their calories from carbs and 30% from protein, while dogs preferred fat (41%) over carbs (36%). Not a single cat or dog chose to get the highest percentage of its calories from protein. Among younger cats, those with less lean body mass preferred protein more than did those with more lean body mass. Younger cats in general preferred protein more than older cats did. Younger dogs with less fat body mass had the strongest dislike toward protein. Dogs with greater fat body mass had the strongest preference for protein. “Because the choice of macronutrients was influenced in both dogs and cats by age and either lean body mass or fat body mass, that suggests a physiological basis for what they chose to eat,” Dr. Hall said. When fed foods with similar palatability, dogs and cats consumed different macronutrient compositions, but the investigators also noted that concentrations of circulating metabolites in cats reflected their food choices. Compared with younger cats, older cats had higher concentrations of sulfated microbial catabolic products. This means if older cats consume more protein than they can use, it’s very difficult for them to dispose of that excess safely. With this new research, veterinarians should be more cognizant of choosing the right diet for the right patient; protein-packed diets may not be the appropriate choice for cats and dogs after all.